The above vacancies are now in existence. The Ranked List published by the Commission in response to this notification shall remain in force for a minimum period of one year provided that the said list will continue to be in force till the publication of a new list after the expiry of the minimum period of one year or till the expiry of three years whichever is earlier. Candidates will be advised from the said list against the vacancies reported to the Commission in writing, during the period of currency of the list. service or services connected with defence, if required. Those who have completed forty five years of age are exempted from the above Compulsory Military Service. 6. Age limit : 24 – 46, Only candidates born between 02.01.1974 and 01.01.1991 (both dates included) are eligible to apply for the post. Candidates from other Backward Communities, Scheduled Castes and Scheduled Tribes are eligible for usual age relaxation. Experience:- Three years teaching Experience after acquiring P.G. in the concerned speciality as stipulated in the regulation of MCI. M.D./DNB in General Medicine with TCMC Registration. (iii) DNB qualifications must be acquired from a Medical College which is recognised by any of the University in Kerala. Candidate having MBBS Degree with TCMC Registration. 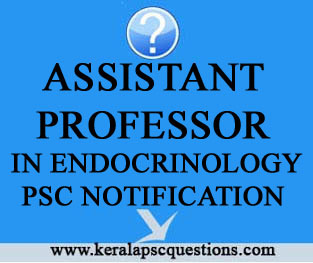 will be considered for the post of lecturer in the Scale of Pay ` 15600-39100/- with grade pay of ` 5,400/-Note:- (i) Rule 10 (a) ii of Part II KS & SSR is applicable. responsible for the correctness of the personal information and secrecy of password. Before the final submission of the application on the profile candidates must ensure correctness of the information on their profile. They must quote the User-ID for further communication with the Commission. Application submitted is provisional and cannot be deleted or altered after submission. The application will be summarily rejected if non-compliance with the notification is found in due course of processing. Documents to prove qualification, Experience, Community, age etc. have to be produced as and when called for. 9.Last date for submission of application:- 03.02.2016 , Wednesday up to 12.00 Midnight.